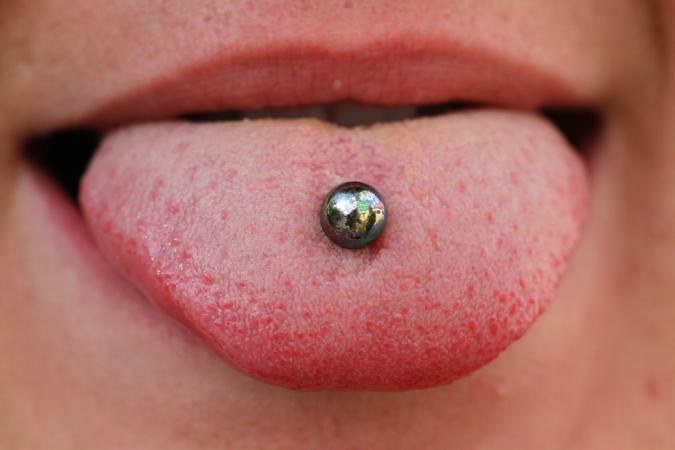 There are definite risks in tongue piercing, and some of them can be severe. You really owe it to yourself to learn about the possible complications before you submit to the needle. Of all the possible ways to pierce the human body, a tongue piercing poses potential risks to your health. Consider the environment for this piercing: the mouth is warm and wet, a virtual hothouse for growing bacteria. As you may already know, bacteria are no piercing's friends, but they are only one of the health risks associated with tongue piercing. Take a look at the list of possible complications, and then you can decide for yourself if you're willing to take the risk. Even the cleanest mouth still harbors harmful bacteria. They are naturally present in varying amounts, especially tucked in around the taste buds. When you pierce the tongue, you offer these bacteria a new home to colonize, creating the risk for infection. This can be quite painful, but that's the least of your worries. If the infection enters your blood stream it can become systemic, meaning it can spread throughout your body. If this happens, you may get extremely sick. Systemic infections can be fatal. Although serious infections associated with tongue piercings are rare, it's important to consider the possibility. A certain amount of swelling should be expected with any tongue piercing; technically it is a wound, albeit one made by choice. The problem becomes dangerous if the tongue swells excessively, because it actually extends into a portion of the throat. When swelling reaches the crisis point, it can actually close off the airway. Suffocation is imminent without immediate medical intervention. Scenario one: The jewelry is aspirated into the lungs. If you're very lucky, the piece can be extracted using a bronchoscope. If you're not so lucky, removal may require lung surgery. Scenario two: The jewelry makes its way into your digestive system. While the ball section poses only a small threat of lodging somewhere along the way, the end with the post has the potential to cause tears and become firmly lodged. Again, surgical removal will likely be required in a dangerous situation such as this. Depending on the exact placement of your jewelry, your barbell can rub against your gums. At the least, this can cause sore spots, but at the worst, it can cause real damage, including gum recession. Open gums expose the roots of your teeth to the possibility of infections that can eat away at the jawbone and cause your teeth to fall out. If the wear is caught in the early stages, you may be able to remove your barbell and allow the gums to heal, but of course this would also allow your piercing to close. If the damage is in the advanced stages, it will require dental surgery to repair the gums, and there's no guarantee you won't still lose your teeth. Steel bars, balls, and teeth do not make an ideal combination. It's possible to wear the enamel away, leaving your teeth open to decay. You can also accidentally bite down on your jewelry, fracturing or actually breaking one or more teeth. Now that you have a clear understanding of the potential risks in tongue piercing, it's time to decide whether to go ahead with your desire to have it carried out, or elect to pierce a less risky body part. If you decide you can't resist forging ahead, then here are a few things you can do to lower your risks, although you should understand that you can't eliminate them completely. Be sure your piercer is a true, licensed professional who works in a shop equipped with an autoclave and understands sterile procedures. In fact, make sure you understand sterile procedures before you even visit a shop so you know what you should be able to expect. Thoroughly brush your teeth, gums, and tongue before you have the procedure. Floss between your teeth, and gargle with an antiseptic mouth wash too. Be diligent about your after care routine. Carefully brush your teeth every time you eat, and gargle four to five time a day with salt water. This will help flush germs and food particles out of the wound, and the salt will help promote healing. Also avoid all oral contact with other people until you are completely healed. Watch for inflammation, severe swelling, sharp pains, and white spots around the wound. Any of these are signs of infection and need medical attention. Should you need medical attention, report to your personal physician or the nearest emergency room for treatment. Your piercer is just that: your piercer. He/She may have experience, but not a license to practice medicine. You need the expertise of a real doctor to prevent your situation from becoming life threatening. While all these risks are real and could happen to you if you choose to have your tongue pierced, that doesn't mean they're automatic. You may experience few or no side effects from this type of piercing. It's simply important to understand what you're getting into before you get such a serious piercing. Once you do understand, you can make an informed decision.